We supply and fit a large range of wrought iron gates and wrought iron railings. Wrought iron gates are a lot more expensive than traditional timber gates but quality does not come cheap. There are a wide range of widths and heights to choose from to fit the available gap or alternatively gates can be made to your own custom size. There are a wide variety of decorative wrought iron gates to suit your property and the site where the gate it to be installed. Wrought iron railings can be used either freestanding on top of an existing or new brick wall to add a touch of elegance to your property and they double as an added security feature. 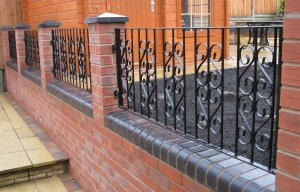 All wrought iron railings are made to measure and you can choose from a wide variety of styles from a basic design to highly complex and ornate designs. 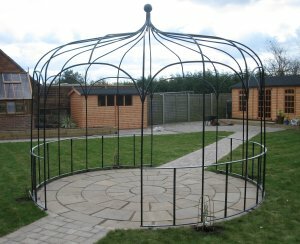 If you are looking for something a little special we can design, manufacture and install wrought iron gazebos. The stunning example was commissioned for a Georgian property in Albrighton and is 12'diamter and nearly 9' high. Due to the weight of the piece, it was transported in sections and we then assembled and welded the sections together onsite. We offer a bespoke design service for wrought iron gates and wrought iron railings anywhere within Shropshire. There are an infinite number of designs and styles available and every installation is different. All of our fabrications are hand painted and we use genuine wrought iron.